“And he said to them, because of the littleness of your faith; for truly I say to you, if you have faith the size of a mustard seed, you will say to this mountain, move from here to there, and it will move and nothing will be impossible to you. But this kind does not go out except by prayer and fasting” (Matt. 17:20-21). There are hundreds of verses in the Old and New Testament that speak of fasting. Many of those verses are around epic stories of how Israel won battles where the circumstances were not in their favor. The Lord was clearly showing that through fasting, the destiny of a nation can change. In the verse directly above, the words “nothing will be impossible to you” is used. If you were to dwell on that phrase alone, it is a mighty big promise from the Lord Himself. So the question must be asked, why do we not fast more often? I think there are many answers to that question, but one conclusion is that we lack the discipline. 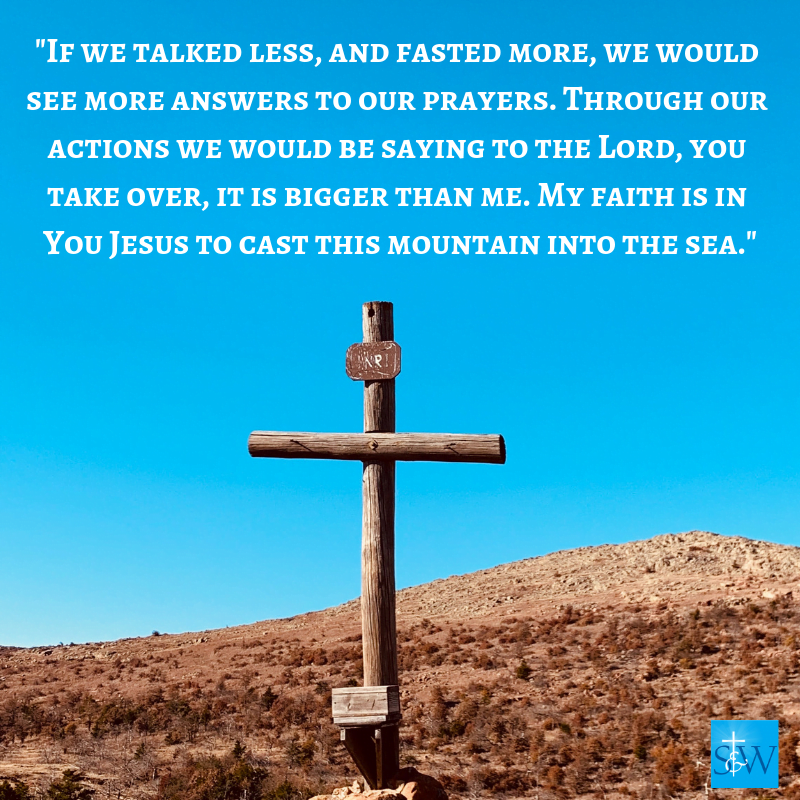 Laziness, lack of belief, a busy schedule, headaches, fatigue, sloth, unwillingness to deny a simple pleasure to our body, not fervent enough to conquer a personal prayer request, not wanting something bad enough, seeing too big an obstacle….are just a few reasons why we don’t fast. But, when the history of the entire bible is viewed through the pages of scripture, fasting is a key spiritual weapon for the salvation of nations and souls. Through fasting we renounce the body, and simultaneously we heighten our spiritual senses. We also become more cognizant of our speech and actions. 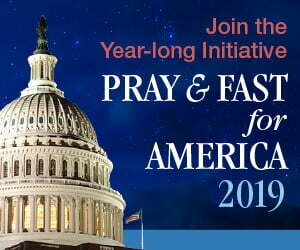 Throughout all of biblical history, fasting has been a staple of an individual or a nation that wants to turn the tide of current events. It is the biblical and historical greats that have made it a part of their spiritual regimen to fast. Today, it is a highly neglected spiritual practice among even the most faithful. If you were to google fasting, hundreds of examples pop up, and those verses are a very small part of the whole story being told. 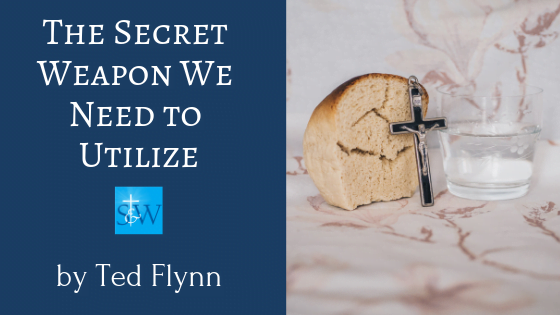 Fasting is a part of the biblical narrative from start to finish. Just before Jesus began His earthly ministry, He went into the desert to fast and prepare Him for His public ministry. Think of how profound it was, that God Himself would do this. “Then Jesus was led by the Spirit out into the wilderness to be tempted by the devil. He fasted for forty days and forty nights after which he was very hungry, and the tempter came to Him (Matt. 4:1-2). When one does fast, it shows they are in serious prayer for an intention. While the young Hebrew nation was slowly marching towards the land of milk and honey, “Yahweh said, Moses, put these words in writing, for they are the terms of the covenant I am making with you and Israel. He stayed there with Yahweh for forty days and forty nights, eating and drinking nothing. He inscribed on the tablets the words of the Covenant —the Ten Commandments.” (Exodus 34:27-28). Above are two of the most significant events in world history. Yahweh is prescribing for His people while wandering in the desert a new covenant, a new way of living for His people that will last thousands of years, — and for some people until this very day. Then, when the Lord gives us a New Covenant that came through His Son Jesus, fasting is the fundamental action needed to get the purity of the event transcribed to the people. Moses and Jesus each fasted for forty days. This defies all rational and modern era reasoning that fasting could alter the destiny of all mankind. If we talked less, and fasted more, we would see more answers to our prayers. Through our actions we would be saying to the Lord, you take over, it is bigger than me. My faith is in You Jesus to cast this mountain into the sea. Queen Esther knew that her people were in trouble and could be destroyed through an evil authority figure of the King of Persia. Knowing the threat was very real, she became very dtermined and said, “Go, gather all the Jews, to be found in Susa, and hold a fast on my behalf, and do not eat or drink for three days, night or day. I, and my young women will also fast as you do. Then I will go to the king, though it is against the law, and if I perish, I perish” (Esther 4:16). The Lord heard their cry, and the Jewish people were spared. Fasting has spiritual and physical components that can prevent us from evil or impure thoughts. 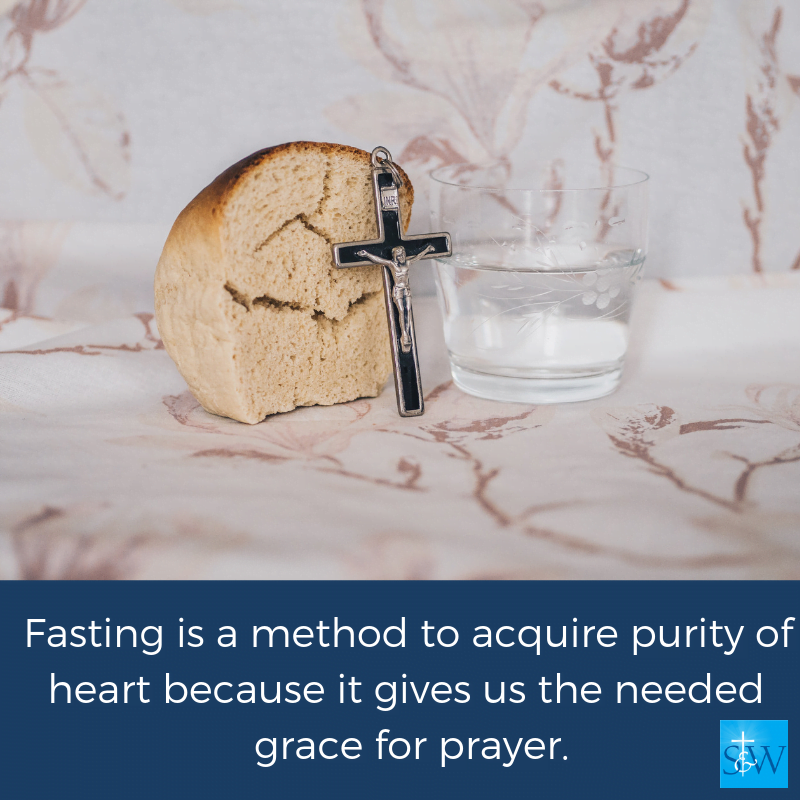 Fasting is a method to acquire purity of heart because it gives us the needed grace for prayer. 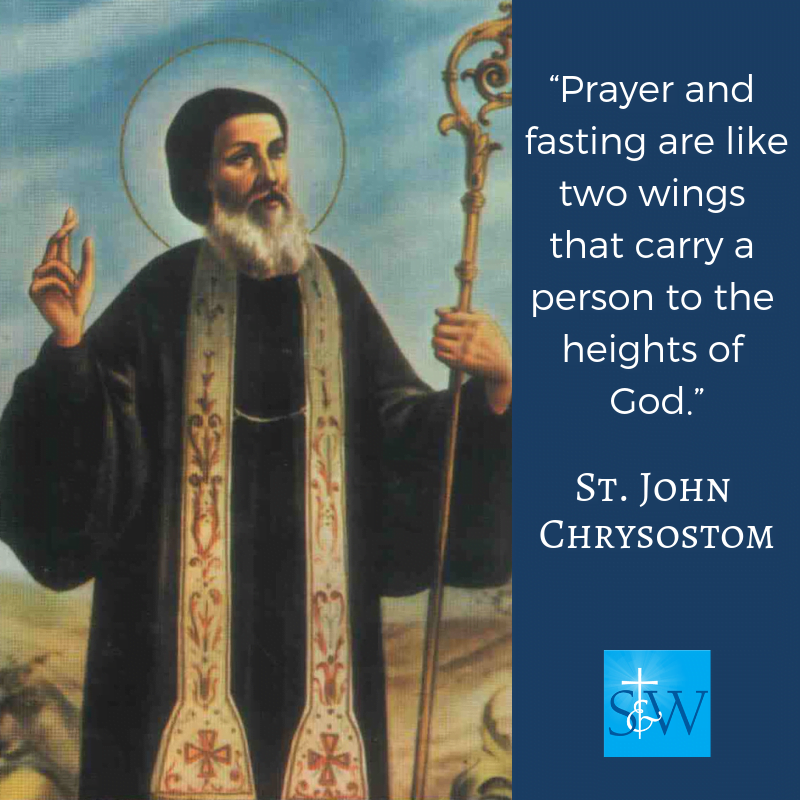 St. John Chrysostom said, “Prayer and fasting are like two wings that carry a person to the heights of God.” Fasting is also a sign of expectation. We are in active supplication and petition asking in faith and in expectation for an answer due to our action because we are trusting God for the outcome. Fasting is an outward sign that we are serious to have a prayer answered. Fasting is for protection. Fasting helps us to become free from what prevents our growth because we are often stagnant and not growing spiritually. There are numerous scriptures that indicate fasting is a sign of repentance. Fasting is a sign of humility. We have in essence thrown up our hands saying, I am at my wits end, and it is time for Your glory to be manifested as this event is too big for me to do, and You alone can change it. We face many of these difficulties in our lives on a daily basis, yet we fail to fast or pray hoping we can change on our own merit alone. First and foremost, fasting requires a discipline and reorienting priorities. For those who are unable to fast for physical reasons, there are other ways of mortification or immolation. The Lord is not a bureaucrat requiring ritualistic formula’s constricting the work of the Holy Spirit. He alone knows our heart when we fast for the correct reasons. He alone is judge. Ascetical reasons alone are not good enough, as many people use fasting as a form of dieting. You will know if you are on the right path if you are exhibiting kindness and mercy. 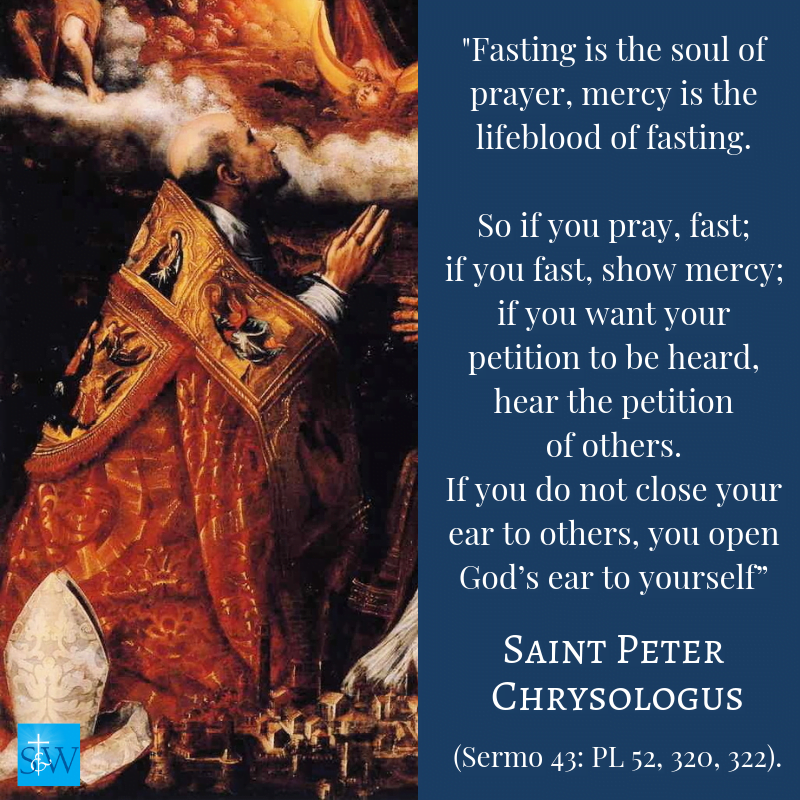 It will curb the sin of Adam and as Saint Peter Chrysologus wrote, “Fasting is the soul of prayer, mercy is the lifeblood of fasting. So if you pray, fast; if you fast, show mercy; if you want your petition to be heard, hear the petition of others. If you do not close your ear to others, you open God’s ear to yourself” (Sermo 43: PL 52, 320, 322). Fasting has been one of the most consistent messages at Medjugorje since Our Lady started appearing there in 1981. Below has been compiled by a Friend of Medjugorje and are just a few of the many that could be listed, but they show how important fasting is in the eyes of heaven. The present fasting in the Church is not adequate. Our Lady desires this to change. She said fasting has been forgotten in the last quarter of this century in the Catholic Church. 5/84. The single greatest discourse of length where Jesus gave instructions on spiritual conduct for the believer in the world was the Sermon on the Mount. His instructions on fasting were, “When you fast do not put on a gloomy look as the hypocrites do; they pull long faces to let men know they are fasting. I tell you solemnly, they have had their reward. But when you fast, put oil on your head and wash your face. So that no one will know you are fasting except your Father who sees all that is done in secret; and your Father who sees all that is done in secret will reward you” (Matt. 6: 16-18).